New Series. I've kind of been doing this for a while but I've never really given it a name. Often I'll see something that is super clever but can be improved upon. So from now on, I'll post "Imagine That" in the title when I find something that has more hidden potential! Hope you enjoy! Retractable table and bench via FP Trgovina. 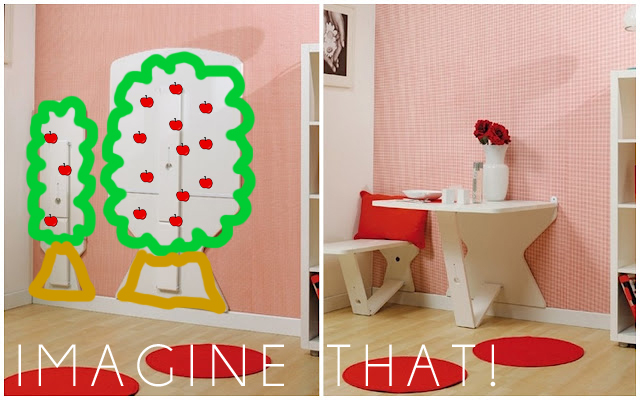 Genius for a kids room that doesn't have a lot of space. But if you DIYed this for a kids room an even BETTER IDEA would be to cut the tabletop and benchtop in a tree shape then paint the underside of the tables green and brown to give it a final "tree" look when folded up. Add details like apples or birds. Finally, paint similar trees on the rest of the wall to blend the table and bench in for a forest feel. If Ana White made a plan for this it would be a BIG HIT!